However, Salado Eagle football parents will be recognized at 6:45 p.m. followed by a performance by the Salado High School Marching Band prior to kick off. Football teams will go to locker rooms. Salado High Band will go to JH Gym. Taylor Band will go to SIS Gym. Homecoming Half-time events will move to SIS Cafeteria. 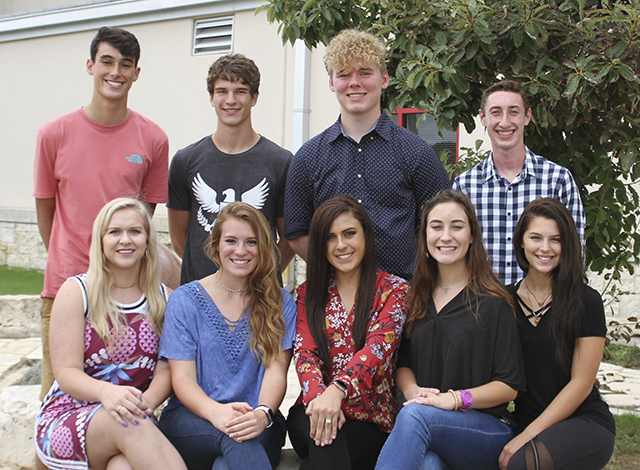 Salado High School Homecoming King and Queen nominees are shown above. Queen nominees on the front row are (from left) Roxi Thrasher, Avery Hyer, Lexie Lima, Sydney Hill and Emili Hercules. King nominees are shown on the back row (from left) Gordon Wilson, Jonathan Keyes, Jeremy Jarvis, Hunter Haas and Tate Harvey (not pictured). The Senior Homecoming Nominees are these: Emili Hercules, escorted by Tate Harvey; Sydney Hill, escorted by Hunter Haas; Avery Hyer, escorted by Jonathan Keyes; Lexie Lima, escorted by Jeremy Jarvis and Roxi Thrasher, escorted by Gordon Wilson. Emili Hercules is the daughter of Christopher and Michele Hercules, and will be escorted by father Christopher. Emili is a member of ASTRA, and enjoys singing, snowboarding, and biking in her spare time. Upon graduation, Emili plans on traveling the world and ultimately landing a career in show business or as a professional DJ. Sydney Hill is the daughter of Ron and Robin Hill, and is being escorted by her father Ron. Sydney is a member of the varsity volleyball team, the National Honors Society, ASTRA, and has been the class favorite 3 years straight. Her hobbies include entertaining the student body with her humor. Upon graduating this year, Sydney plans on attending Texas State University to major in criminal justice. Avery Hyer is the daughter of Tom and Melissa Hyer. She is being escorted by Father Todd tonight. Avery is a member of the Varsity volleyball and golf teams, ASTRA, Salado Youth Leadership, and the Salado Student Council. Avery’s primary hobby is going to Arushas and drinking coffee. Upon graduation, Avery plans on attending Texas Tech University and majoring in PGA Management. Lexi Lima s the daughter of Lisa and Andrew Lima and is escorted by her Her Dad Andrew. Lexi is a member of the Salado Varsity basketball team, National Honor Society, student council, ASTRA, and is captain of the varsity cheer squad. Lexi enjoys hiking, swimming at the lake, hanging out with her friends, and being the loudest person anywhere she goes. She plans to attend Texas A&M University next fall to major in biology and pursue a career as a pediatrician. Tate Harvey is the son of Michael and Cassie Harvey. Tate is a member of the varsity football team, ASTRA, Courage Crew, and is also the student senate president. Tate plans on attending Texas Tech University next fall and is undecided on his major. Hunter Haas is the son of Dana and Shay Haas. He participates in Cross Country, band, soccer, track, and is on the yearbook staff. In his spare time he enjoys listening to bangers, watching Netflix, and running fast. Hunter is interested in running track at the next level upon graduating from Salado. His ultimate goal is to become a high school track coach. Jonathan Keyes is the son of Joe and Kathy Keyes. Jonathan is a member of the Salado HS Marching Band as well as the Varsity soccer team. In his spare time, Jonathan enjoys practicing soccer and watching unreasonable amounts of Netflix. After graduating High School, he plans on staying somewhere in Texas to attend college and major in business. Jeremy Jarvis is the son of Jeff and Kristi Jarvis. Jeremy is a member of the Varsity basketball and tennis teams, a member of student senate, as well as ASTRA and yearbook. Jeremy’s hobbies include binge-watching Netflix, breaking ankles at the Methodist church, and giving everything he’s got in the student section during athletic events. 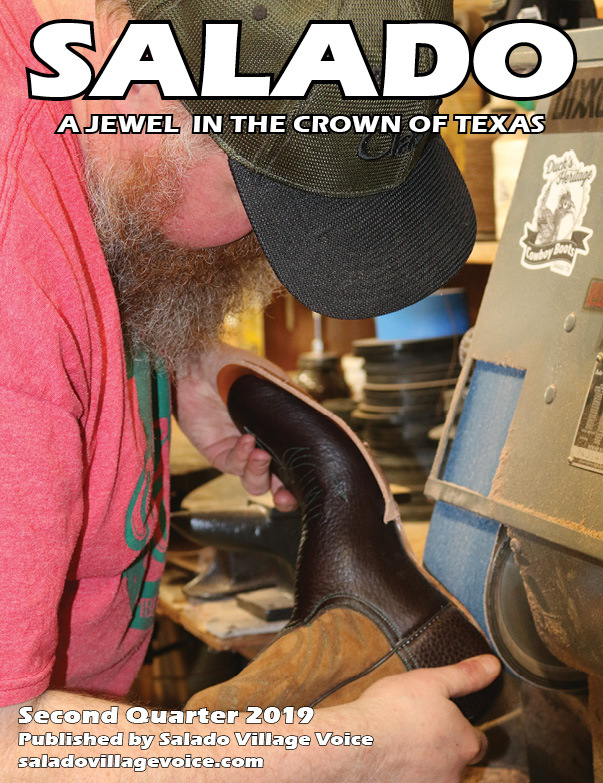 After graduating High School, Jeremy will pursue a business degree at Texas State University. Gordon Wilson is the son of Gordon and Melissa Wilson. Gordy is the Senior Class Vice President, and is involved in football, tennis, Salado Youth Leadership and Student Senate. Gordy’s hobbies include smiling, creating highlight videos on youtube, and interpretive dancing. Gordy is currently undecided on which college he’ll attend after graduation, but he does plan on becoming a famous and successful model in the near future.